The Panoramic Camera is known by its nickname, Pancam. Two cameras work in combination to take detailed, multi-wavelength, 3-D panoramic pictures of the Martian landscape surrounding the rover. LOCATION:Mounted on the rover mast at average human-eyesight level, about 5 feet (1.5 meters), with about 11.8 inches (30 centimeters) between them. POWER:3 Watts for the CCD and electronics; 3.5 Watts for a small warmup heater. SIZE:Small enough to fit in the palm of your hand. COLOR QUALITY:8 filters per eye cover 400-1100 nm (near-UV to near-IR), allowing full-color images and spectral analysis of minerals and the atmosphere. IMAGE SIZE:1024 x 1024 pixels (equivalent to 20/20 human vision). IMAGE RESOLUTION:~0.04 inch (1 millimeter) per pixel at a distance of 9.8 feet (3 meters) from the rover. FOCAL LENGTH:~1.5 inches (39 millimeters), with optimal focus from 5 feet (1.5 meters) to infinity. FOCAL RATIO AND FIELD OF VIEW:f/20, yielding an IFOV of 0.27 mrad per pixel and a FOV of 16.8 degrees x 16.8 degrees. STEREO SEPARATION:~11.8 inches (30 centimeters) between the two cameras. 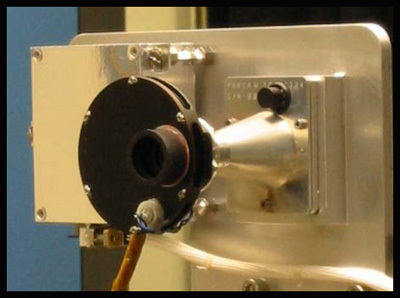 Pancam is a high-resolution color stereo pair of CCD cameras used to image the surface and sky of Mars. The cameras are located on a "camera bar" that sits on top of the mast of the rover. The Pancam Mast Assembly (PMA) allows the cameras to rotate a full 360° to obtain a panoramic view of the martian landscape. The camera bar itself can swing up or down through 180° of elevation. Scientists use Pancam to scan the horizon of Mars for landforms that may indicate a past history of water. They also use the instrument to create a map of the area where the rover lands, as well as search for interesting rocks and soils to study. The Pancam cameras are small enough to fit in the palm of your hand (270 grams or about 9 ounces), but can generate panoramic image mosaics as large as 4,000 pixels high and 24,000 pixels around. Pancam detectors are CCDs (charge coupled devices). These devices form the image, just as film does in a film camera. 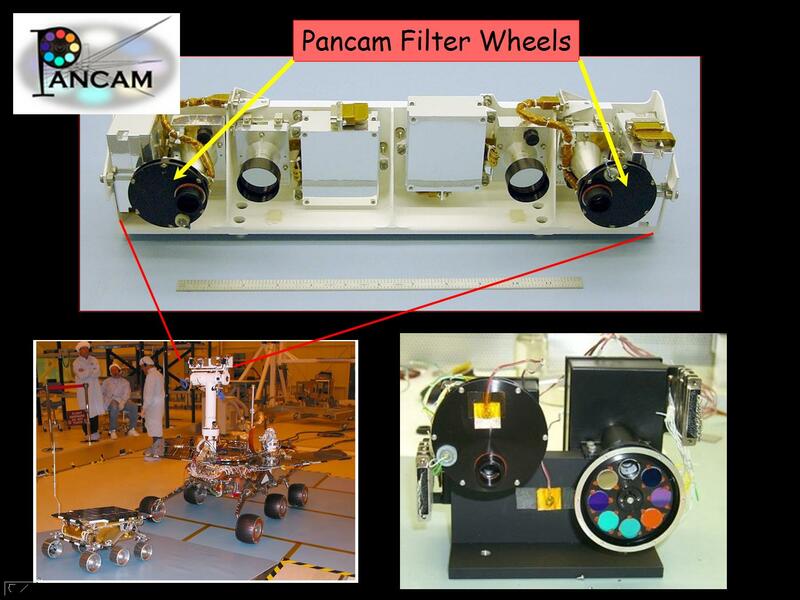 Each "eye" of the Pancam carries a filter wheel that gives Pancam its multispectral imaging capabilities. Images taken at various wavelengths can help scientists learn more about the minerals found in martian rocks and soils. Blue and infrared solar filters allow the camera to image the sun. These data, along with images of the sky at a variety of wavelengths, help to determine the orientation of the rover and provide information about the dust in the atmosphere of Mars. The Pancam color imaging system has, by far, the best capability of any camera ever sent to the surface of another planet.